In light of the super-awkward national anthem faux pas at the Fed Cup tennis tournament in Hawaii on Saturday, when part of the German national anthem from the Nazi era was sung, RT examines other embarrassing moments when national anthems went wrong. 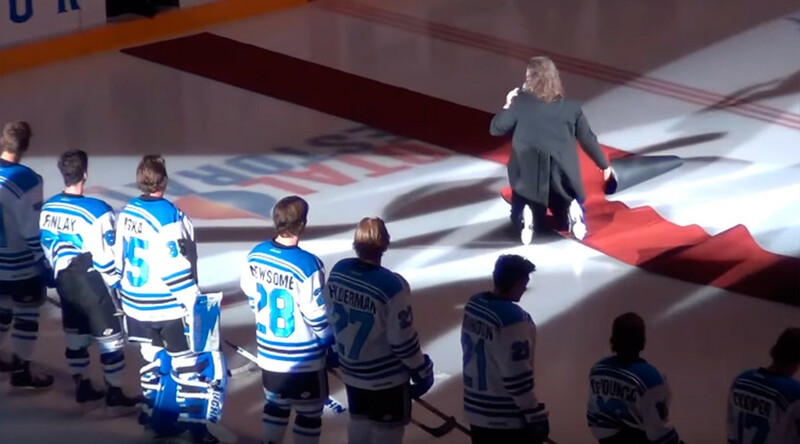 When singer Mark Donnelly took to the ice to perform ‘O Canada’ at the Penticton Vees junior A hockey game in British Columbia, he didn’t expect that his rendition of the national anthem would bring him to his knees. But, brought to his knees – and his face – he was, as the combination of skating and singing proved too much. Poor Donnelly tried to make the show go on, but the ice and the red carpet forced him to the ground again. When he finally got to his feet, he pointed his mic to the crowd in an apparent act of defeat. The Australian field hockey team were extremely unimpressed when, at a World Hockey League match against Belgium in Rotterdam, officials played the national anthem of neighbors New Zealand instead of Australia. The players’ faces say it all. As Malta geared up to play Slovakia in a friendly soccer match in the MSK Zilina Stadium in 2014, the Maltese team were very amused to hear the start of Linkin Park’s Numb play out over the speakers, instead of their own national anthem. The music was quickly cut off, and the correct song was located. Young Ethan Hall bravely battled through a bout of the hiccups as he sang the Aussie national anthem before an Australian Baseball League game between the Brisbane Bandits and Adelaide Bite. His sterling efforts were applauded by all in attendance. When Russian President Vladimir Putin visited Egypt for the first time in a decade in 2015, local officials were left red-faced when the Egyptian Army’s orchestra performed a very questionable – and almost unrecognizable – version of the Russian national anthem. Despite the cringeworthy rendition, both Putin and Egyptian President Abdel Fattah el-Sisi were forced to stand awkwardly listening to the entire thing. Unfortunately, this wasn’t the only time the Egyptian orchestra messed up a visiting nation’s national anthem. When French President Francois Hollande visited Egypt in 2016, he too had to endure an odd rendition of the French national anthem. In an unfortunate faux pas, organizers at a regional ski festival in Kostanay, Kazakhstan accidentally added some latin flare to proceedings by briefly playing RIcky Martin’s 1999 hit, ‘Livin’ la vida Loca’ instead of the Kazakhstan national anthem ‘Meniñ Qazaqstanım’ ('My Kazakhstan').